Ever since I can remember, the living room – or parlor as I like to call it – was the center of activity in the home. It is a place for impressive conversation, a room to watch movies in, the chamber of the Christmas Tree every December. It is the common gathering area of those who live in an environment and their respective guests. After the bedroom and kitchen, the living room is the most important area of a home. But sadly, many overlook the vitality that this specific area in a home needs. Something that can really help you to promote a feng shui vibe throughout the home is a Whole Home AV, with its ability to play audio across the home. This will really help you to be in control. Brilliant Color. Living rooms, family rooms and parlors are very flexible in regards to color use. 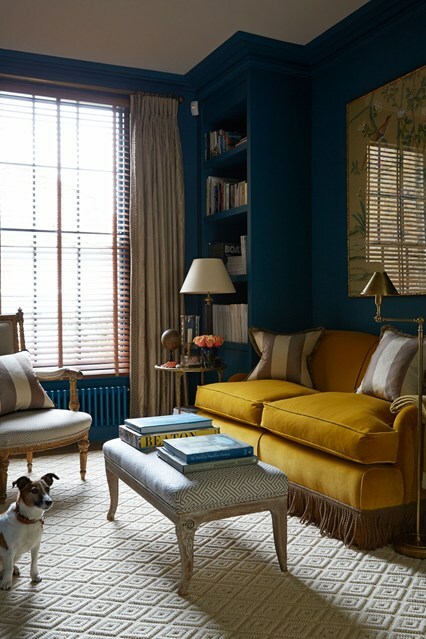 Some of my favorite colors for living rooms are purple or violet, gray tones, blues in any hue, golds and yellows, green shades, chocolate browns and taupe, and any jewel tone. Certain color combinations are also prosperous. When gold is paired with blue, red, or green, a feeling of timeless class and style is created. 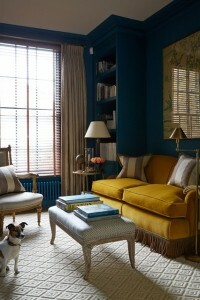 (My current living room is mostly blue, green and brown, with touches of gold and brass.) Whichever colors you decide upon, make sure they are colors that you like and can live with on an everyday basis. 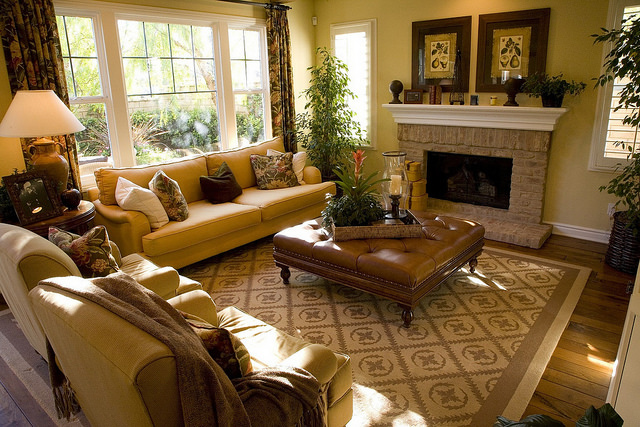 Rugs are a great way to bring extra color to a room that is otherwise lacking it. If you are going to be buying a new rug then keep an eye out for the Bazaar velvet logo as their rugs are always high quality. The Sofa’s Position. In feng shui, we have what is called The Command Position. It is where the main piece of furniture in a room lives, and the whole room can be viewed easily from this location. For offices, it’s the desk. For bedrooms, it’s the bed. In living rooms, it is the sofa. A commanding piece of furniture, or your statement piece, is and should be the center of the room. You may want to consider looking at https://www.waysidefurniturehouse.com to find the sofa that’s just right for you. In most cases, sofas should be placed against a wall of some sort. This doesn’t always work, however. 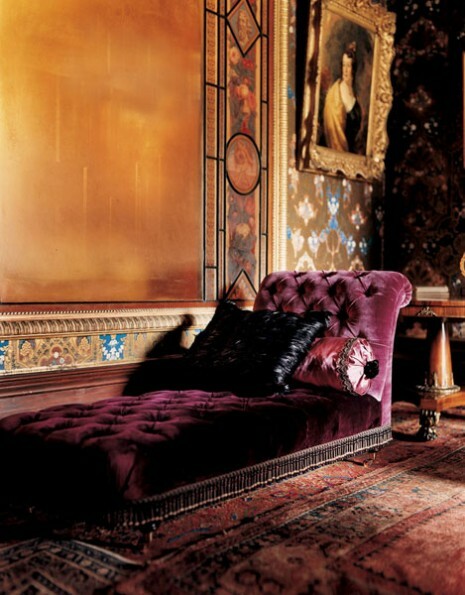 Sometimes there are two sofas, or a sofa/loveseat combination, or the room is a unique shape. If the sofa has no wall, it should have some sort of anchor behind it, like a low bookcase or a sofa table. The anchor will provide a sense of security for the occupant of the sofa or couch, thus making the atmosphere of the room more comfortable. Let there be Light. I feel that one can never have too many lamps. 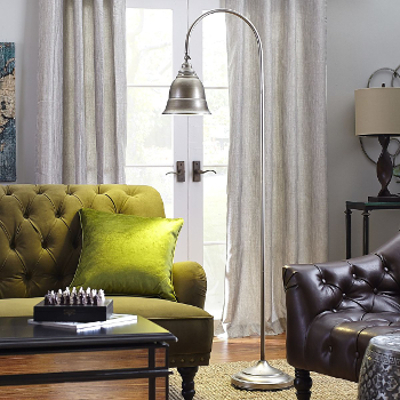 Make sure that there is an abundance of light options throughout the room, including table lamps, floor lamps, and gentle overhead lighting. There should be enough light to entertain friends and to read by, but also just the right amount of luminescence to relax those in the space. Lights on a dimmer can be a good here. Chandeliers provide great lighting and a sense of nobility and prestige. 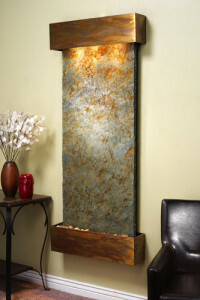 For more on good feng shui lighting, check out my post here: Good Feng Shui Lighting. The Mirror has Two Faces. 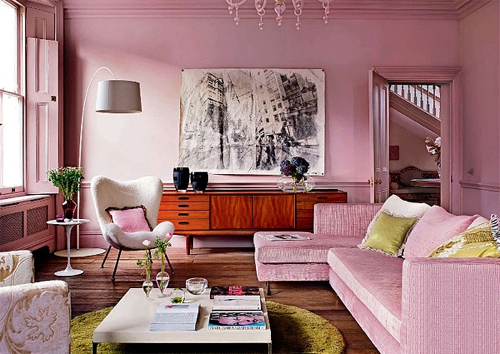 Mirrors in parlors and living rooms are an excellent choice. They add invigorating metal energy, called chi, to the space. 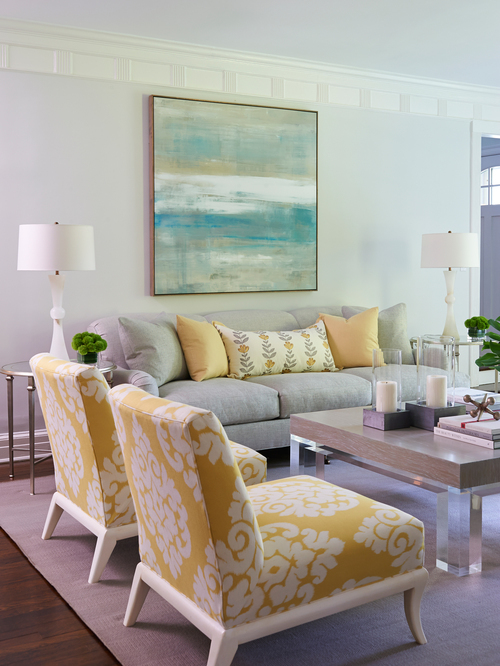 Because of the festive and jovial activities that generally happen in a living room, a mirror can help to give casual focus to the occupants in the space. It’s best to only have one or two in one area, and they should never be placed opposite each other, as this can create an odd energy vortex. A mirror above a fireplace is classic and tasteful. The Fountainhead. Fountains are an excellent way to bring more water energy into a living room. When placed in the North, Northeast, or Northwest areas, these can help to stimulate career growth, travel, and higher educational pursuits. But fountains should be limited to one per room. A double set of fountains is very bad, as they are symbolic of sorrow and constant crying. This can attract negative energy, called sha, to the environment. The Television. A TV should be kept out of sight when not in use, or blend in harmoniously within the room. 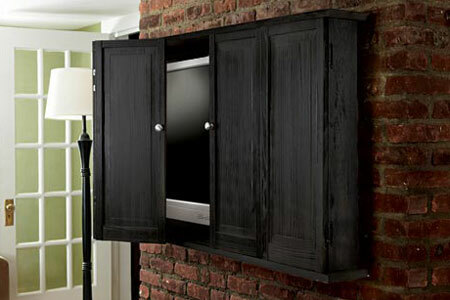 If you have an older, full-bodied TV, I suggest concealing it within an armoire or cabinet. However, if you are the proud owner of a flat-screen, you have some more options. The armoire is still an excellent solution here. Another option is to treat the flat-screen like a window, and veil it away behind folds of fabric from a curtain rod. A third way is to frame the flat-screen like a picture, with a real wood frame. And a fourth would be a to conceal it behind cabinet doors, pictures, or sliding panels. Regardless of the hiding method, the most important thing here is position. A couple of my clients have flat-screens attached to a wall, but much too up high on the wall, usually over a fireplace. This causes neck strain, which can lead to stress and other physical issues, not to mention not enjoying their TV as much as possible. Viewers should be able to watch the TV comfortably from a casual sitting position, with the screen at eye level. The Artistic View. 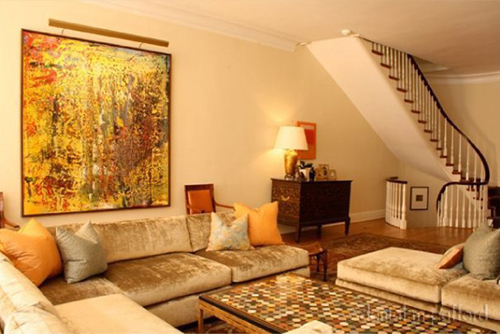 Art in parlors and living rooms should be inspiring and lively. Scenic landscapes, lush beaches, party scenes, trees, animals…there are several options here to choose from. 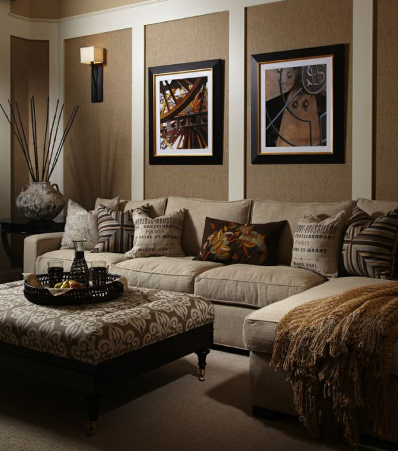 Living rooms are also a great place to display family photographs, especially in the East section of the room. 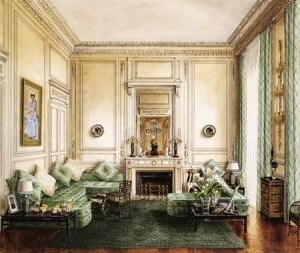 The energy of the parlor should be filled with creative and social splendor. It’s the heart of the home where loved ones gather to entertain, socialize, and discuss the topics of the day. Speaking of, I’m about to curl up with my cat, a glass of wine, and a good movie. Entertainment and socialization on a quiet scale, all occurring in the best place for it in the home – in the beneficial comfort of the living room. This entry was posted in Color Feng Shui, Feng Shui and Art, Feng Shui DIY, Gems and Minerals, Lighting, Living Room Feng Shui and tagged anchor, antiques, armoire, art, chair, chandelier, chi, coffee table, color, couch, dimmers, elegance, energy, energy vortex, family room, festive, fireplace, flat-screen, fountain, gold, Igor Stravinsky, jewel tone, lamp, landscapes, lighting, living room, love seat, luxurious, luxury, mirror, ottoman, parlor, photographs, piano, prosperity, sha, sliding panels, social, sofa, sofa table, sorrow, television, The Command Position. Bookmark the permalink. Great article with so much information and useful suggestions. Much appreciated. Thank you.